Absolutely fascinating and a test of a young person’s patience. 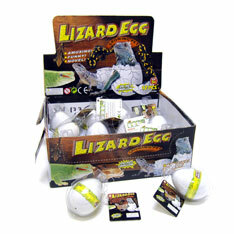 A 6 inch large lizard breaks through and gradually emerges from its egg when kept in water for at least a week! It’s worth the wait! Sold per dozen. Packaged in individual poly-clamshells with header. $10.65 per dozen for 12 dozen or more. $9.45 per dozen for 24 dozen or more.